You know how sometimes when you order a product you get this inch-thick instruction manual that you never read, but also how there is sometimes a QuickStart Guide of 5-10 simple steps to get you up and running quickly? How can you know where you are going to go with innovation if you don’t first know where you already are? For this reason I created a 50 question innovation audit and linked it to an Innovation Maturity Model from Karl T. Ulrich and Christian Terwiesch of Wharton Business School. Here is a simple exercise you can do next time you get together in your organization to talk about innovation. Have everyone in the group write down what their definition of innovation is, and then compare that to the official definition of innovation for the organization (if you have one) and the innovation definitions of others in the group. Defining innovation as an organization is important because it helps you determine what kinds of innovation you are focusing on as an organization, and what kinds of innovation you ARE NOT focusing on. Creating a definition of innovation is the first step in creating a common language of innovation. The importance of creating a common language of innovation is that language is one of the most important components of culture. If people in your organization don’t talk about innovation in a consistent way and see communications reinforcing the common language, how can you possibly hope to embed innovation in the culture of the organization? Ensuring consistent language in presentations, emails, etc. and having people read the same book on innovation or taking the same training courses are just some ways to help create and reinforce a common language of innovation. A startup begins life as a single-minded entity focused on innovating for one set of customers with a single product or service. Often as a company grows to create a range of products and/or services, the organization can start to lose track of what it is trying to achieve, which customers it is trying to serve, and the kind of solutions that are most relevant and desired by them. Is innovation important or not? Are we focusing on innovation or not? What kind of innovation are we pursuing as an organization? Is innovation a function of some part of the business? Or, is innovation something that we are trying to place at the center of the business? Are we pursuing open or closed innovation, or both? Why should employees, suppliers, partners, and customers be excited to participate? When people have questions, they tend not to move forward. For that reason it is crucial that an organization’s leadership both has a clear innovation vision, and clearly and regularly communicates it to key stakeholders. If employees, suppliers, partners, and customers aren’t sure what the innovation vision of the organization is, how can they imagine a better way forward? 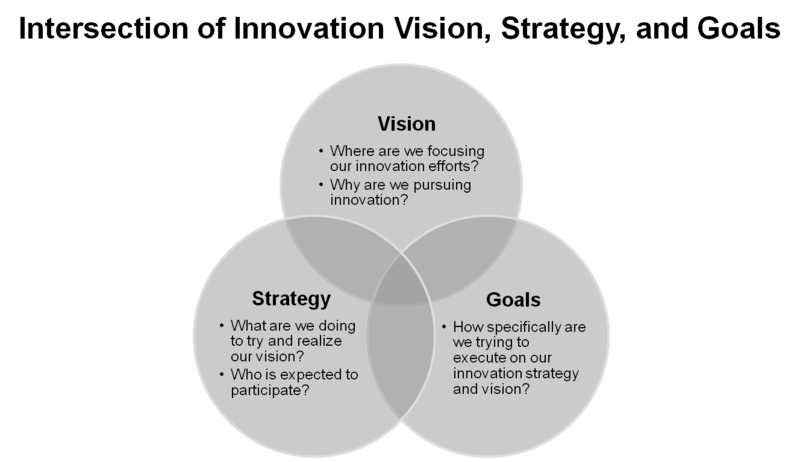 Many organizations take the time to create an organizational strategy and a mission statement, only to then neglect the creation of an innovation vision and an innovation strategy. An innovation strategy is not merely a technology roadmap from R&D or an agenda for new product development. Instead, an innovation strategy identifies who will drive a company’s profitable revenue growth and what will represent a strong competitive advantage for the firm going forward. Under this umbrella the innovation goals for the organization can be created. An innovation strategy sets the innovation direction for an organization towards the achievement of its innovation vision. It gives members of the organization an idea of what new achievements and directions will best benefit the organization when it comes to innovation. As with organizational strategy, innovation strategy must determine WHAT the organization should focus on (and WHAT NOT to) so that tactics can be developed for HOW to get there. Just as managers and employees need goals to know what to focus on and to help them be successful, organizations need innovation goals too. Clear innovation goals, when combined with a clear innovation strategy and a single-minded innovation vision for the organization, will maximize the instinctual innovation that emerges from employees and the intellectual innovation that occurs on directed innovation projects. The 50% goal gives employees and management something to measure against, and it sets a very visible benchmark that the whole organization can understand and visualize how big the commitment and participation must be in order to reach it. It is at this point of communicating the innovation goals that senior management also has to communicate how they intend to support their efforts and how they will help employees reach the innovation goals. Product managers leading product groups and general managers leading business units typically have revenue numbers they are trying to hit, and they will spend their budgets trying to hit those numbers. As a result, there are often precious little financial resources (and human resources) available for innovation projects that don’t generate immediate progress toward this quarter’s business goals. As a result, many organizations find themselves setting money aside outside of the product or business unit silos that can be allocated on the future needs of the business instead of the current needs of the product managers and general managers. This also allows the organization to build an innovation portfolio of projects with different risk profiles and time horizons. But, however you choose to fund innovation projects, the fact remains that you need to have a plan for doing so, or the promising projects that form your future innovation pipeline – will never get funded. Some organizations allow employees to spend a certain percentage of their time on whatever they want, but most don’t. Some organizations allow employees to pitch to spend a certain percentage of their time on developing a promising idea, but most organizations are running so lean that they feel there is no time or money for innovation. Often this is true and so employees sometimes work on promising ideas on their own time, but they shouldn’t have to. And if you make them do so, it will be much more likely that they will develop the promising idea with others outside the company and the organization will gain nothing from these efforts. Don’t turn your motivated intrapreneurs into entrepreneurs. You must find a way to create resource flexibility. Organizations that want to continue to grow and thrive must staff the organization in a way that allows managers to invest a portion of their employees’ time into promising innovation projects. One model to consider is that of Intuit, which allows employees to form project teams and to accumulate percent time and then schedule time off to work on an innovation project with co-workers in the same way that they schedule a vacation. This allows the manager to plan for the employees’ absence from the day-to-day and allows the employee to focus on the innovation project during that scheduled leave from their workgroup. But that’s just one possible way to create human resource flexibility. Innovation = Value Creation (x) Value Access (x) Value Translation = Success! Value Creation is pretty self-explanatory. Your innovation investment must create incremental or completely new value large enough to overcome the switching costs of moving to your new solution from the old solution (including the ‘Do Nothing Solution’). New value can be created by making something more efficient, more effective, possible that wasn’t possible before, or create new psychological or emotional benefits. Value Access could also be thought of as friction reduction. How easy do you make it for customers and consumers to access the value you’ve created. How well has the product or service been designed to allow people to access the value easily? How easy is it for the solution to be created? How easy is it for people to do business with you? Value Translation is all about helping people understand the value you’ve created and how it fits into their lives. Value translation is also about understanding where on a continuum between the need for explanation and education that your solution falls. Incremental innovations can usually just be explained to people because they anchor to something they already understand, but radical or disruptive innovations inevitably require some level of education (often far in advance of the launch). Done really well, value translation also helps to communicate how easy it will be for customers and consumers to exchange their old solution for the new solution. The key thing to know here is that even if you do a great job at value creation, if you do a poor job at either value access or value translation, you can still fail miserably. There is a lot of chatter out there about the concept of ‘failing fast’ as a way of fostering innovation and reducing risk. Sometimes the concept of ‘failing fast’ is merged with ‘failing cheap’ to form the following refrain – ‘fail fast, fail cheap, fail often’. Now don’t get me wrong, one of the most important things an organization can do is learn to accept failure as a real possibility in their innovation efforts, and even to plan for it by taking a portfolio approach that balances different risk profiles, time horizons, etc. But when it comes to innovation, it is not as important whether you fail fast or fail slow or whether you fail at all, but how fast you learn. And make no mistake, you don’t have to fail to innovate (although there are always some obstacles along the way). With the right approach to innovation you can learn quickly from failures AND successes. The key is to pursue your innovation efforts as a discrete set of experiments designed to learn certain things, and instrumenting each project phase in such a way that the desired learning is achieved. When you start from this question, every project becomes a series of questions you hope to answer, and each answer moves you closer to identifying the key market insight and achieving your expected innovation. The questions you hope to answer can include technical questions, manufacturing questions, process questions, customer preference questions, questions about how to communicate the value to customers, and more. AND, the answers that push you forward can come from positive discrete outcomes OR negative discrete outcomes of the different project phases. The ultimate goal of a ‘learning fast’ approach to innovation is to embed in your culture the ability to extract the key insights from your pursuits and the ability to quickly recognize how to modify your project plan to take advantage of unexpected learnings, and the flexibility and empowerment to make the necessary course corrections. The faster you get at learning from unforeseen circumstances and outcomes, the faster you can turn an invention into an innovation by landing smack on what the customer finds truly valuable (and communicating the value in a compelling way). Fail to identify the key value AND a compelling way to communicate it, and you will fail to drive mass adoption. When you start with an innovation audit and creating a common language of innovation (including a definition of innovation), it sets you up well to create a coherent innovation vision, strategy, and goals. And then if you build in the financial and human resource flexibility necessary to create a focus on value creation, access and translation – and support it with a culture that is focused on learning fast – YOU WILL have built a solid foundation for your innovation efforts to grow and mature on top of. Are there more things that go into embedding innovation into your culture and creating sustainable innovation success? Absolutely. But, if you work diligently on these ten items you will get your innovation efforts off to a strong start. Hi Braden – As a set of steps to achieve a simple innovation foundation, this is useful. As a “QuickStart Guide” (mentioned in the first sentence), I would differ. Working through these steps would increase readiness, but not have achieved any innovation (unless it is implied in steps 9 and 10 that innovation “happened”, ala Julia Child and the souffle that was already in the oven). A quick start guide should outline how to get innovation results within a very short timeframe (less than four months). By innovation results I mean an actual innovation which has been designed and prototyped and market-tested, including at least one round of iteration. Also, the first few rounds of results-getting can further inform many of the infrastructure builds that are listed above. Thank you for the comment Andy. A QuickStart guide is designed to get you up and running and highlight the things you should do first. Working through these will definitely get you up and running, but innovation with a big I is not a sprint, it’s a marathon. So, sure an organization can try to run an innovation sprint by jumping to #9, but it will only be a temporary fix – if it is successful. The innovation with a little i may happen in #9, but without #1-8 and #10, you will never achieve the continuous innovation that most organizations are seeking to sustain growth for the long term (innovation with a big I). There is always magic involved, but if you only focus on trying to learn the trick, you’ll learn how to do the illusion but not how to do magic. The conventional wisdom – promoted by all large consulting firms that need to turn every engagement into a massive, 18-month infrastructure build before results can be achieved – is actually not how most organizations succeed with change. Ask anyone in an organization to describe an actual, exciting, productive change experience, and you will find that the stories they tell span days, not months. A better model is to begin innovating, on a small scale, learn from the experience both in terms of results and infrastructure, then gradually improve the process by adding the minimum possible structure to keep things going. Innovation is definitely all about change, and what better way to make the experience more enjoyable than to use the Change Planning Toolkit™ (https://bradenkelley.com/change-planning-toolkit) which I introduced in my second book – Charting Change. Innovation efforts do require some level of commitment from leadership though, if they are to succeed, as real innovations take more than a few days, as they begin with idea fragments, that must be assembled, reconciled, and combined into something bigger, for which the fatal flaws must be identified and worked through. Poorly conceived or poorly supported innovation programs are destined to fail. Innovation programs are just like houses, you’ve got to build a strong foundation, which is what I’ve highlighted in the article. Taking the innovation audit is a good way to diagnose the health of your innovation efforts.